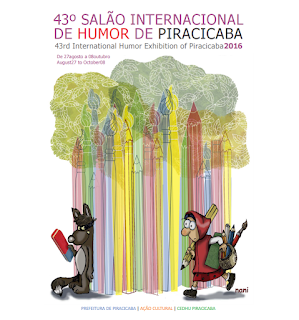 The 43rd lnternational Humor Exhibition of Piracicaba 2016, realized bythe Piracicaba City Haii/Cultural Action Secretariat/National Graphic Humor Center of Piracicaba in will be held in accordance with the followings cheduIe – Registration: until July 22. Selection Jury: July 30 and 31. Awards Jury: August 20. Opening Ceremony: August 27. Closing: 08 October. The works - all categories - can be sent by MAlL or ELECTRONIC (applications over the Internet on the official website, in the format and 300 DPI, JPEG, attached Images at once). The graphical technique is free. Digital copies signed by author and sculptures with humorous content will also be accepted. Maximum measures allowed: paper- 42 x 30 centimeters (A3) (16,54 x 11,81 inches), sculptures - 42 centimeters or 16,54 inches (height) x 30 centimeters or 11,81 inches (depth) x 30 centimeters or 11,8 1inches (width). Each artist may enter a maximum of 03 works per category: Cartoon (graphic humor with universal and timeless themes), Charge (graphic humor with journalistic themes of now a days), Caricature(graphic humor that expresses the physical and/or personality of a known celebrity), Comic Strips/Comic Stories (graphic art in sequence. Caution: for comic stories will be accepted a maximum of 02 pages per work) and Theme MOBILITY (only for works that address the theme MOBILITY, proposed by the organization). Along the registered artwork, the artist must attach a complete registration form with legibly writing. lt is also requested reduced curriculum and photo, for registration in the CEDHU's data base. c) One prize called Popular Jury "Alceu Marozi Righetto", in the value of R$ 5.000,00 (five thousand reais),chosen by online open voting. The contestants to this award will be selected by the Awarding Committee. The indicated, such as the schedule and the local for the voting will be announced on the event's opening. d) Also planned: a prize of R$ 5.000,00 (five thousand reais) called CHAMBER OF MUNICIPAL OF PIRACICABA award, exclusively for the caricature category; a prize of R$5.000,00 (five thousand reais) called UNIMED HEALTH AWARD for work for any category that explore the themes of health and a prize of R$ 5.000,00 (five thousand reais) called ÁGUAS DO MIRANTE AWARD, intended to work by Brazilian authors in any category. Beside the money prize, the awarded artists will be receiving trophies (a creation of Zélio Alves Pinto). Other awards and honors may be imposed at the discretion of the Organizing Committee. There will be a Selection Jury and an Award Jury composed by qualified people in the area. lf the Award Jury finds any type of fraud or pIagiarism in one or more registered works, the Jury may cancel the award. The result of the award may be contested until a week after the opening of the Exhibition, with reasonable evidence of any wrong doing without acknowledgement of the committee. In case there is some fraud and plagiarism in award-winning works, the prize awarded will be canceled. In the case of effective cancellation of the prize to the first place, it will be awarded to 2nd place (if any) and so on. The premium payment will be made only on current account in the name of the holder prize winner. If the winner does not present timely banking information, the award will be canceled. The simple application requires the artist to accept these regulations. The selected artists automatically transfer the authorial rights of his artworks for reproductions and publications in any media, without restriction, aiming promotion of the event. The returning of the artworks after the closing of the exhibition must be formally requested early in the registration form. Otherwise the artworks will ultimately belong to the collection of the NationaI Graphic Humor Center of Piracicaba, which will exercise the right of property, as it finds interesting. 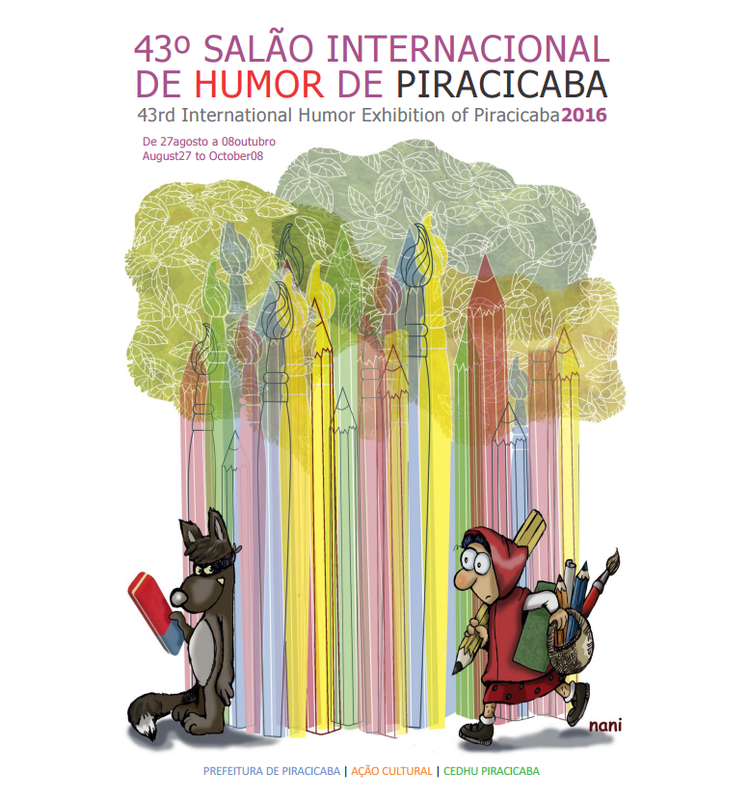 The organization of the 42th lnternational Exhibition Humor of Piracicaba is not responsible for possible damages that may happen when the arts are sent or returned. The authors transfer automatically Authorial Rights of his artworks when awarded acquisitivetely (including mentions), in accordance with the Law n 9610, February 19st, 1988 (Authorial Rights Law),therefore, universal and definitely in all use modalities and gratuitous, the rights of the author, guaranteed by the mentioned law; referring to the awarded artworks in the lnternational Humor Exhibition of Piracicaba and now integrant part of Municipal Public Property for the purposes of entitlements, in accordance with the Municipal Law n 2249,1976, partially amended by the Municipal Law n 2486-1982 and consolidated by the Municipal Law n 5194-2002.